Until humans arrived 750 years ago, New Zealand was a paradise for birds. Facing almost no competition or predation from mammals some of them took a deeply eccentric turn. The adzebill evolved such an odd body that, hundreds of years after it went extinct, ornithologists have struggled to work out how it lived, and identify its nearest relatives. Dr Kieren Mitchell of Adelaide University has helped solve its family tree, but admits to being stumped on the first question. There is really nothing else like it that we know of today, so it’s hard to make comparisons. Mitchell is co-author of a paper in Diversity showing the adzebill’s nearest living relatives are Madagascan birds barely 1000th of its weight. This opens up the question of how the adzebill’s ancestors traveled between such distant places. 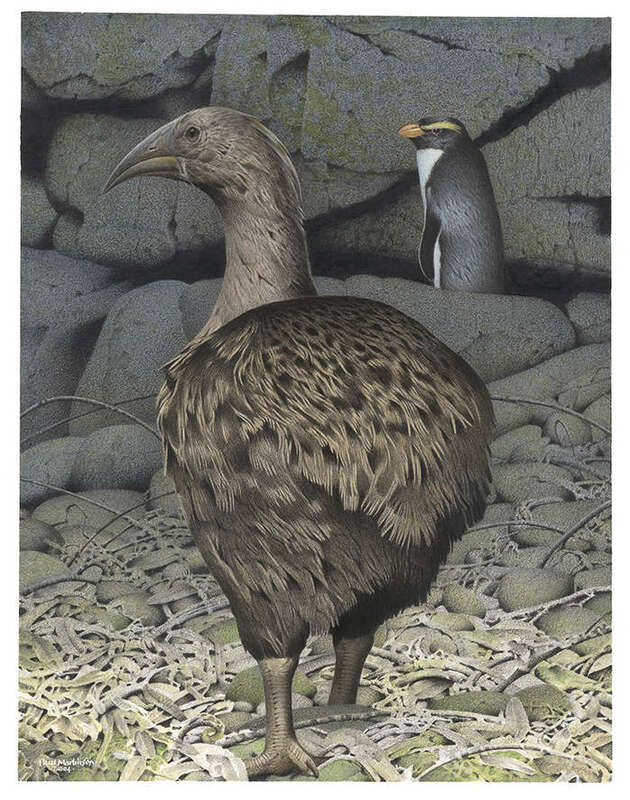 Prior to humans (and accompanying rats) arriving in New Zealand, the islands were inhabited by birds as large as the moa, the largest of which weighed 250 kilograms (550 pounds). By those standards, the adzebill, which weighed up to 19 kilograms (42 pounds), sounds small, but it was probably the island’s heaviest predator. Today only seven species of birds weigh more. Like the moa, and many surviving New Zealand birds, the adzebill was flightless. Flying takes a lot of energy, and when you don’t have to deal with predatory mammals it makes sense to abandon it. However, this was no defenseless herbivore. Adzebills’ isotopes reveal them as predators, although their exact diet is unknown. Mitchell told IFLScience their “heavily reinforced legs and skull” may have been used to smash open rotten logs to get at insects or small lizards living inside. Using DNA extracted from adzebill bone fragments and eggshells Boast and Mitchell have found they were closest to the Madagascan wood rails and flufftails, which live both in Madagascar and on the African mainland. The last common ancestor appears to have lived around 40 million years ago. Although Mitchell told IFLScience their ancestors could presumably fly, Madagascar to New Zealand is still an epic journey. With New Zealand’s most famous bird, the kiwi being related to Madagascar’s mighty elephant birds, and related species of teals living in both places, it seems there was a passageway between the two locations which many birds took. Rather than being via Australia, the authors think the connection was through Antarctica, which had forests around its coast until around 34 million years ago. Mitchell explained to IFLScience that 30-40 million years ago when the journey took place Gondwana was long broken up, and the continents positioned not too far from where they are now. Migratory birds of many species apparently flew from Madagascar to the Antarctic fringe, and at some point later their descendants made the journey to New Zealand before losing the power of flight. Unfortunately, evidence to confirm this theory is likely buried under the Antarctic ice and therefore very difficult to access. The first adzebills evolved from these migratory ancestors on New Zealand’s South Island and apparently did so quickly since a fossil from 16-19 million years ago looks quite similar to more recent examples. They walked across to the North Island during a period when the two were connected by a land bridge 1.5-2 million years ago. Once the connection was lost, the populations diverged to become two species, both of which survived until shortly after human arrival in the 13th century.